over 25 years of the agency’s 45 years of history, I can tell you I have seen major changes in how we expect to age. We no longer accept that the only thing we can do when we retire is to sit down, slow down or quit. The 60+ population in our area is as young at heart as their grandchildren. It inspires me on a daily basis to keep working for the benefit of seniors. We dreamed for many years of providing seniors in Columbia County a beautiful facility which would offer physical fitness, fellowship, enrichment activities, good food and the opportunity to build a new community of support for the Third-Third of their lives. We have been greatly blessed in our mission. The LEC is the fulfillment of Phase One of our vision. I cannot believe that we will celebrate the 10th anniversary of the LEC’s in April of this year. Within Phase One we also envisioned a medically run adult day care specifically designed for enriching the lives of dementia patients. This vision has also been fulfilled – The Club will celebrate its 4th year of service in September of this year. While we continue to build sustainability, we also think about the vision of Phase Two – a full wing dedicated to physical fitness and the promotion of a healthy lifestyle. This facility will have a heated therapy pool for all of us who are plagued by arthritis in all of its many forms. We will keep you informed of our progress in this endeavor as we prepare for it. When I look at the day to day challenges of keeping a small non-profit alive and well I could easily become discouraged. My dear friend, Margaret Wuest, who was my constant encouragement way back when gave me a note for my bulletin board which read, “God is on our side, we cannot lose.” Every day I am convinced that God approves of our programs and will grant us the resources when He sees fit. Have a healthy 2017! The 2017 new Board members met on January 17, 2017 for orientation and to get acquainted with the organization. The new incoming president is Roger Whiddon, Vice President, Sammie Everett, Secretary, Renee Faulkner, Treasurer, Charles Peeler, Immeidate past president, Tammy Hall. Other new members include Deserrai Davis, Danette O’Neal and Annie Winnett, RN. and returning are Lorraine Zarrella, Dr. Ivan A. Lopez, Kathy Verchik. Special thanks to the board members whose term of office ended for their service to the organization. They are Tammy Hall, Joan Allison, David Cobb, Ronnie Brannon, Milner Osborne, Alka Patel, Dusty Bailey, Zack Paulk, John Kendron, Amy Francis and David Royal. 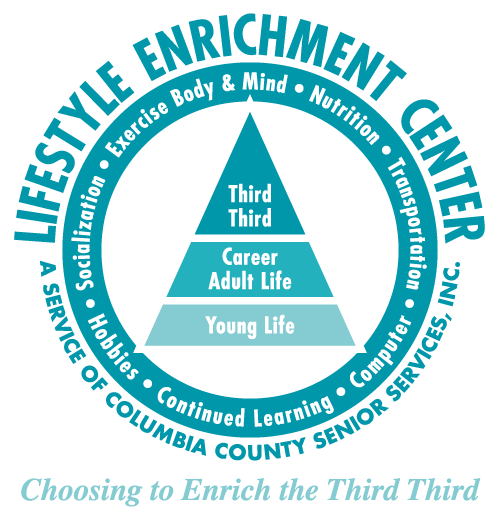 The Lifestyle Enrichment Center held a donor appreciation reception during December. Guests were able to enjoy the music and seranade of the Kitchen Band under the Direction of Sharon Turner, Volunteer. During the evening the officers of the Suwannee Valley Community Foundation presented a check for $5,000 for the purchase of new telephones for the Lifestyle Enrichment Center. 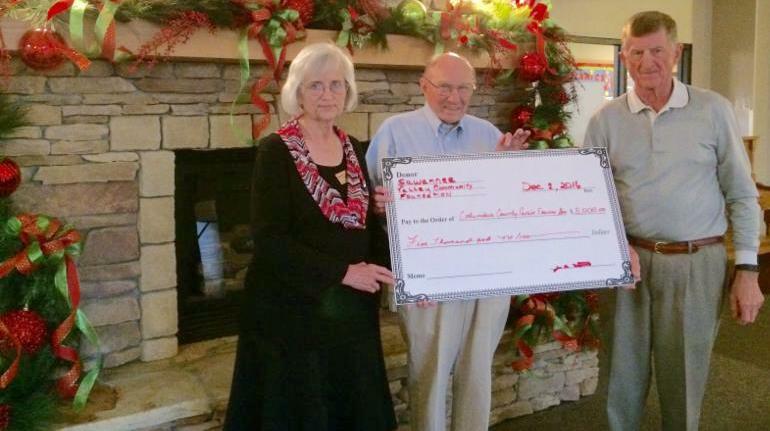 We applaud the Foundation and thank them for truly making a difference for the over 60 population we serve. All of the guests were given the new shrink wrapped logo T-shirt as a special thanks for their support of the first Annual Fund Campaign. Born in Norcross, Georgia in 1929 George ended up going to school in Miami. His father could not find work in Georgia and when he found a job in Miami he could not leave. His father said he loved the weather and would never leave. Young George worked at delivering ice after school for a penny a pound. When he graduated, he became a tile setter and because he enjoyed it so much he did that until he retired. After his wife died he moved to Lake City where he lived with his daughter for a while before going to a retirement facility. He served in the Florida State Guard when he was 16 and then in the US Army. He has 2 children, 6 grandchildren and 4 great grandchildren. During his army days, he could travel to Japan, Korea and Germany. He enjoyed working on cars. He could take them apart and put them back together. He always did his best a whatever he did. 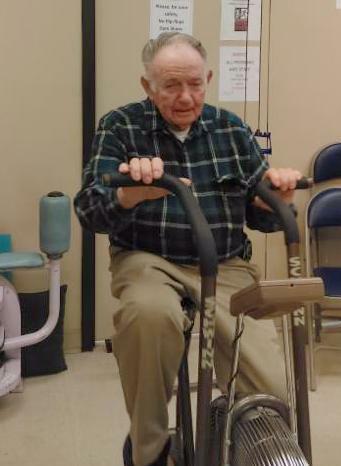 He now enjoys coming to the Lifestyle Enrichment Center where his favorite activity is lifting weights. George says” I had no idea time would pass so quickly and I would be old before I knew it.” We congratulate George Simpson as senior of the month.